In Part 1 of this series, we looked at how smartphone use was affecting your relationship. 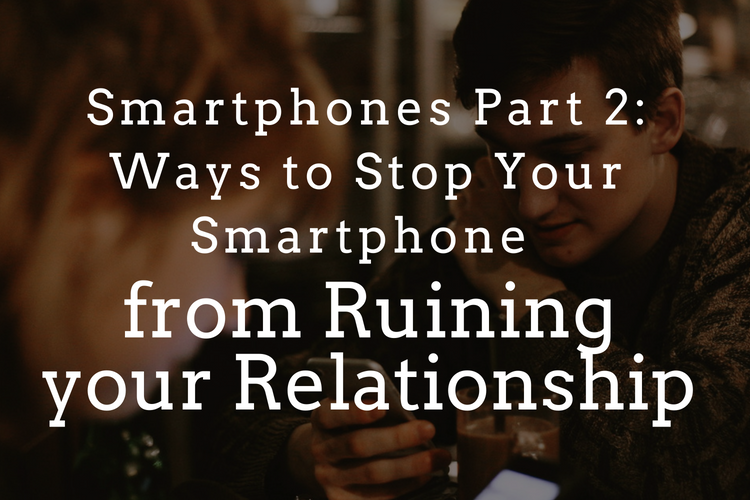 In Part 2, we’ll give you three ways you can stop your smartphone from ruining your relationship. These are techniques we encourage in our couple’s therapy sessions and you can try them for yourself or seek the help of a therapist. To maintain a relationship that is strong and healthy, both partners need to be actively engaged. This means paying attention to each other in the present, working hard to actively meet each other’s needs, and going out of your way to make the other feel heard, understood, and special. Though it’s certainly easy to fall down the technology rabbit hole, when you find ways to put down your phone and purposefully engage with your partner, you will start to see positive changes in your relationship. It’s critical to have time together – without your phones – this will help you feel closer and more connected. Because you’ll spend time together that is quality and interactive, rather than just in the proximity of each other. Building a relationship with less technology will help you forge a bond without distractions. More importantly, you will be able to recognize your partner’s need for you to be genuinely present with them, and vice versa. Remind yourself: Sitting next to your partner on the couch does not mean you are interacting with your loved one. A relationship is about paying mindful attention to what the other is expressing and finding ways to validate their needs and desires. Ultimately, prioritizing mindful intimacy that is lived out in real time is the most essential element of creating a long-lasting and deeply connected relationship. It’s true that smartphones are an essential part of our society and they aren’t going anywhere. But they can also impact your connection to yourself and your loved one. The key is to learn how to use your phone mindfully, intentionally and in ways that actually enhance your life and your relationship. It is possible to find a way to balance technology use and personal attention within our relationships. Here are three strategies to make sure you and your partner are on the same page about smartphone use in your relationship. The first thing to do when reflecting on smartphones in your relationship is to figure out what is actually bothering you about your partner’s phone usage while taking an honest look at your own usage. Do you go to bed at night looking at your phone? Is your phone the first thing you reach for in the morning? Are you or your partner on your phone in the middle of the night? Are you missing out on time to cuddle at night or in the morning? Are you on phones at home during meal time? Do you often try to talk to your partner and get a distracted answer because they are on their phone? All of these are signs that smartphone use is a problem within your relationship, but it’s worth finding out what in particular bothers you about this. Most likely it’s the fact you and your partner feel like less of a priority than an inanimate object in your relationship. The impact of technology overuse is subtle and often hidden and normalized. The benefits of smartphones are undeniable, but too much use separates us from our loved ones and disconnects us from actually living our lives. True intimacy takes place when we are enjoying the exact same moment at the exact same time as our partners. So, it is important for the health of your relationship to create opportunities for this type of intimate connection to take place. Becoming mindful and taking care to pay attention to the present moment is a sure way to increase the happiness you experience with your partner. Read more about how to be happy using mindfulness. Once you have gone through steps one and two it is much easier for the two of you to figure out what works for you both when it comes to smartphone use in your relationship. Reflecting on what it is that bothers you about smartphone use in your relationship and making intimacy a priority, can help you come up with a plan that is mutually beneficial. For example, you might agree to set aside certain times where you refrain from technology use. You could set aside an entire day that is phone or tech-free or simply setting a cutoff time of 8 pm. You might also designate certain areas as phone free such as the bedroom or the dinner table. It’s no secret that technological advancements have changed the way you interact with everyone you know. But that does not mean that smartphones have to have a negative impact on the relationships with those you love the most. Think your relationship might be overrun by technology?